Reduce heat mirage from your barrel that can cause errors in sight picture. Quick release Bipod for use in Target Rifle. Mounted and removed without need for any tools by squeezing the legs together. 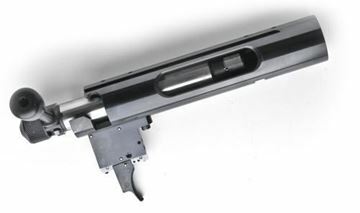 This Barrel Vice enables the shooter or gunsmith to quickly change barrels off or on the range with ease. Stainless Steel Pepperpot Muzzle Brake offered in a variety of threads with or without taper to match your barrel outside diameter. Thick 100% polyester fabric protects against dirt and scratches Drawstring closure Treated with silicon to help protect from rust. Sold in multiples of 100. Sierra has enhanced a segment of the MatchKing line by adding the acetal resin tip, thus crowning the Tipped MatchKing (TMK) bullet line. The major advantage of adding a tip to the bullet is the reduction of drag, producing a more favorable ballistic coefficient. Restricted postage, please call for details. Brass Monkey, a product specific for cleaning the brass cartridges for rifles and pistols. A lightweight digital reloading scale, pocket size for use either in the reloading room or at the range. Please Note: Bore-tips are not recommended for use with solvents designed to remove plastic. Bore-tips are NOT compatible with military grade G96 brand or aerosol solvent/degreasers. Lyman's Universal Rod Guide helps to prevent stripping of your cleaning rod by your trigger sear and dropping shavings into your trigger. Perfectly aligns your cleaning rod to the rifle bore with a specially machined port for application of cleaning fluid to a patch. All new for 2018 The HPS Convertible Bipod. Available in Short and Long Leg styles, the short leg offers 80mm raise and the long 110mm when attached to a standard accessory rail.